How ribbons have replaced the faces of patients. Whenever you see a pink ribbon, you think of breast cancer. You think of the runs, the walks, the races, concerts and countless other themed gatherings to raise money and awareness for a cancer that women in the U.S. have a one in eight chance of getting. It’s safe to say the majority of women in this country and around the world are fully aware. Just in time for National Cancer Survivor Day 2012 is Lea Pool’s recent documentary, Pink Ribbons, Inc. The film delves into the sad world of pink ribbon campaigns for breast cancer that pop up in countless countries and territories around the globe, aiming to show audiences the need to be more critical and aware of the truth behind these campaigns. Those profiting from fundraising events are the sites and the companies sponsoring the event— scarcely the women diagnosed. The ones who profit from making pink Teddy bears, pink vacuums, pink toilet paper and hundreds of other pink products are the producers of the item. Did you know that there was a pink handgun available to raise awareness for breast cancer? The actuality, which is clearly conveyed in the film, is that there is a suffering population being misrepresented or all together ignored. 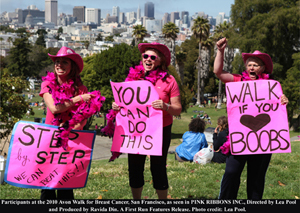 One major way is how events, such as the Revlon Run/Walk for Women in New York, the Avon Walk for Breast Cancer in San Francisco and the Susan G. Komen Race for the Cure in Washington, D.C., are conveyed to the public. Often, they are represented as celebratory, cheery events where men, women and children come together to form a community against a disease. This portrayal often makes patients and survivors feel alienated because they are either facing or may have faced their own mortality. It is hard to put on a smile and be festive after that. The participants and donators in the runs and walks may have the best intentions and wishes for those who are sick or have survived. However, there is the business behind the events that utilizes the opportunity to push products (i.e. sports drinks, waters, juices, smoothies, etc.). The problem is there is little regulation of where funds go. Populations change, environments change, chemicals used in everyday products and foods change. Yet there is limited knowledge about what causes breast cancer and how environmental factors may affect a woman’s chances of being diagnosed. A small percentage of the funds raised each year go to looking into the factors that make certain women more likely to be diagnosed, while a larger piece goes to prevention and a cure. This truth ignores the fact that breast cancer is not one disease with one cause. There isn’t only one way to catch it, one speed of growth and one cure. If there are so little being done in the field of finding the causes, how can any doctor or scientist hope to find a way to prevent it or cure it? See the film in New York beginning June 1. The film opens in theaters on June 8 nationwide. More information is available online at http://firstrunfeatures.com/pinkribbonsinc/.